"An excellent, flavorful refreshing salad." Place garlic and salt in a wooden salad bowl; mash together with a fork until creamy. Mash capers into garlic paste. Mash anchovy paste into garlic mixture until creamy. Whisk olive oil and black pepper into garlic mixture with a fork until well blended; stir in Worcestershire sauce, vinegar, mustard, and hot pepper sauce. Whisk egg yolks into mixture; whisk in lemon juice. 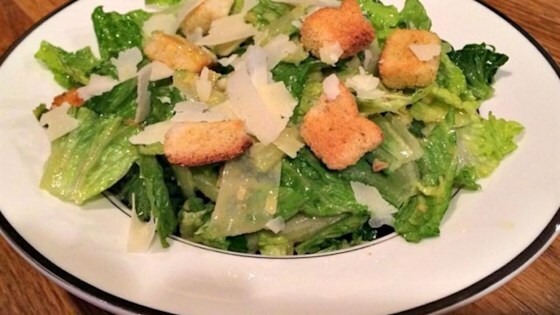 Place romaine into the salad bowl and toss with dressing. Sprinkle salad with bacon bits, croutons, and Parmesan cheese. Use 2 heads of romaine lettuce if you like your salad less saucy. YUM! The only change I made was adding a whole egg, and not adding bacon or capers which no doubt would have only made the dressing even better! Go Canada!